In the town Skellefteå in north of Sweden, a sort of a food trend started to appear a couple of years ago. By combining the two favorite fast foods hamburger and pizza, mainly the restaurant Tre kronor (Swedish for Three crowns) in this area came up with the ultimate solution for everybody having difficulties choosing between the two meals after a hard night out drinking; the Calskrove. 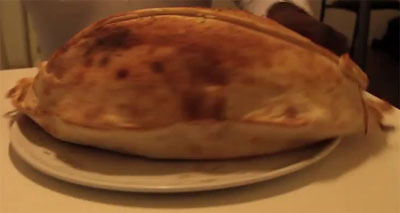 Calskrove is a word play on the baked in pizza calzone and the Swedish world ”skrovmål”, which in English means similar to a blowout meal. 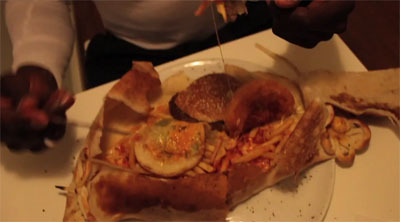 With a Calskrove, a complete hamburger meal with two hamburgers with bread, toppings and dressings as well as the french fries (no soda though) are baked in a calzone pizza. This staggering combination should fill even the biggest stomachs and costs around 100 SEK (circa 10€ / 15 USD). According to the restaurant, it’s actually not that uncommon that locals chooses the Calskrove when eating there! So if you have already tried the Heart attack grill in Arizona and eaten the world’s biggest burger in Detroit, maybe a Calskrove in Skellefteå, Sweden should be something for you! As you can see, there’s a new design here at FUBARtrivia! The site have now also moved from the domain FUBARtrivia.net to FUBARtrivia.com, but the .net-domain still gets you here. Soon you will see new strange, unbelievable and amazing trivia here at the site as well! Fetus in fetu or Foetus in foetu is a rare medical condition in which a person develops the forming of a mass of tissue resembling a fetus inside the body. Fetus in fetu occurs to about one in 500 000 live births and is said to either be the cause of a normal fetus eveloped inside its twin or that the mass is a highly developed teratoma (an encapsulated tumor). In the theory of the fetus in fetu being a teratoma, it thought that two fetuses during pregnancy share a common placenta in which one fetus wraps around the other and the fetus wrapped inside becomes a parasite which feeds on the host’s blood supply. The parasitic twin in this case has no brain and is almost always unable to survive on its own. A fetus in fetu’s organs have a working blood supply from its host, but never any functional brain, heart, lungs, gastronomical or uninary functions. It works more like a parasite than an human being. The Indian man Sanju Bhagat is a more known case of fetus in fetu. Sanju Bhagat, from Nagpur India had a swollen stomach, could barely breathe and looked like he was about to give birth to a baby. One night in June 1999, the 36-year old finally after all those years thought his big belly was more than a cosmetic problem. The doctor’s thought Bhagat had a giant tumor so big it was pressing on his diaphragm causing his problems to breathe. During the serious operation, the doctors discovered something unexpected, as gallons of fluid spilled out from Bhagat’s stomach: the doctor could shake hands with somebody inside. The doctors discovered a lot of bones, limbs, hair and a jaw and genitalia in Bhagat’s stomach. The creature inside the stomach had hands and feet very developed as well as long fingernails. Sanju Bhagat is one of fewer than 90 cases of fetus in fetu recorded in medical litterature. However, usually both twins die before birth because of having to share the same placenta, but in this case the fetus managed to feed off Bhagat for 36 years and survive. Another more known case of fetus in fetu is Alamjan Nematilaev, then in 2003, a seven year old boy from Kazakhstan. Alamjan complained in about something moving inside of him which led doctors to perform an operation. As whit Bhagat, doctors found an identical twin brother growing inside of Alamjan, which had part of a head, som hair and teeth and even something resembling of a face. Doctors were unsure what caused the boys condition and tried to figure out if it had anything to do with the radiation from the Chernobyl disaster, but it was most likely because of Alamjan being the fetus wrapped around his twin. The reason Alamjan felt the fetus move inside him, was because the fetus can develop a primitive spinal reflex system and in some cases limbs and fingers if it gets enough blood. Ever went on a trecking trip in the woods and feeling the cravings for a cheesburger but not being near a burger restaurant in miles? Luckily there’s Cheesburger in a can which lets you bring a ready cheesburger in your backpack. 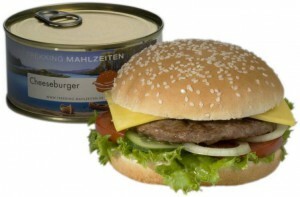 Cheesburger in a can is from the german webshop ”Trek’n eat” which specializes in food and drinks to bring outdoors. The cheesburger in a can is prepared by simply heating the unponened can in a double boiler for about 10 minutes, then open and eat. According to the product label, the cheesburger may be consumed cold or hot. Trek’n eat describes the product as ”The cheeseburger, which is marketed under the Trek‘n Eat label, guarantees unrestricted enjoyment in the mountains and in other extreme environments”. The ingredients in the cheesburger in a can is: bread rolls, beef meat, cheese, sauce and with all the required food colourings, conservations, acids, sweeteners and treatments for it to stay fresh on the shelf for a year. The canned cheesburger can be stored on the shelf of twelve months without the requirement of refrigeration. The people at the website AVclub tasted Trek’n eats canned cheesburger. The verdict? Terrible. The Cheesburger in a can seems to not be available for shipping outside of Germany at Trek’n eat and also seems to be hard fo find on eBay, but there’s some tests circulating the web. Meatwater have a wide range with over 25 different flavors, such as beef jerky, chees burger, chicken teriyaki, fish ’n chips, buffalo wings, english breakfast and swedish köttbullar. Meatwater says their drinker can distinguish several flavours in one bottle, such as the flavours for egg, bacon and buttered toast in their ”basic breakfast”-taste. Meatwater drinks was founded by Till Krautkrämer and Brian Kane in the beginning of 2007 as an answer to the modern man’s more and more filled time schedule. Metwater should be a great time saver for athletes with a high calorie intace whom have to eat a lot of food to endure all the training. It should also be good for people having trouble eating regular meals or for paranoid people with bombshelters in their backyard. Many consumers of Meatwater chooses to mix the drinks with Vodka, thus combining both meal and a liquor drink at the same time. Meatwater even posts cocktail-recipes on their website’s news section, such as ”Wings on the beach” containing 2 parts Vodka, 1 part Cointreau and 1 part Meatwater Pigs with Wings. The Jewel wasp or Emerald cockroach wasp is a parasitoid which uses their venom for reproduction. The only hunts and parasite certain types of bigger roaches. When the Jewel wasp attacks, the first sting is delivered into the cockroach’s nervous system, temporarily paralyzes the legs and enables the jewel wasp to deliver a second sting into its brain. Because of the stings, the roach’s dopamine is disabled which turns it to a zombie with no ability to move. The wasp then leads the roach into a burrow where the roach is sealed in for a hibernation-like state. The jewel wasp’s offspring emerges from the roach in form of a larvae which gets nutrition from the cockroach and then leaves the dead body after 6 weeks, full grown. The Jewel wasp is common in the tropical regions of South Asia, Africa and the Pacific islands. The Wasps have a metallic blue and green body with the third pairs of legs red. The female is circa 22 mm long and the male is a bit smaller and without a stinger. The World’s biggest burger weighs 134 (60,78 kg) pounds and comes in a 50 (22,67 kg) pound bun. The burger’s weight totally is 184 pounds or 83,46 kg – that is like a grown man! The burger is actually available for order from ”Mallie’s Sports & Grill Bar” in the town Detroit, Michigan. The burger is called ”Absolutely Ridiculous Burger” and is a bacon cheesburger. To order the burger, you have to give the restaurant a 24-hour notice and pay $350 USD. Absolutely Ridiculous Burger was created for the first time in February 2008. The head chef spent 12 hours preparing and cooking the burger and it took three men to flip the burger’s bun. On February 23rd 2008, Absolutely Ridiculous Burger has the updated the record for biggest burger in the book Guinness World Records. The record was earlier held by the 123-pound (55,79 kg) burger made in 2007 by Denny’s Beer Barrel Pub from Clearfield, Pennsylvania. Michael Wilkinson is a 23-old man from Lancashire in England who was pronounced dead on February 1st, 2009. Michael was sent to the Royal Preston Hospital after collapsing after an evening of some drinking with his family, which triggered an undiagnosed heart condition. After being clinically dead for 30 minutes and given the last rites, the doctors realised that Michael’s pulse had return. He was alive another two days before being pronounced dead a second and final time on February 3rd. Michael Wilkinson was returned to life because he had a condition called Lazarus syndrome which means spontaneous return of circulation once attempts at bringing back to life have failed. Lazarus syndrome has only up to 38 recorded cases in the world and got its name after the biblical story of Lazarus being raised from the dead by Jesus. In other cases, the person with the syndrome has survived after being pronounced dead and even recovered fully. In 2007, an American woman named Judith Johnson was pronounced dead because of a cardiac arrest after indigestion and sent to the morgue. At the morgue, they discovered that Judith was still alive. Judith later sued the hospital and staff for the damages she now has as a supposed result of the medical care she received. Last week, FUBARtrivia visited London, England and stopped by at ”Ripley’s Believe it or not! museum”. The museum is a collection of strange, amazing and rare objects and people from all around the world collected by the entreprenour Robert Ripley. The London museum is the world’s largest Ripley’s Believe it or not! museum and it opened on August 20, 2008 at Picadilly Circus. A woman with huge lips. Patrick Deuel a.k.a. "The Half ton man". He was one of the heaviest persons with a peaking weight of 486 kg. Scold's bridle, a Scottish torture device from the 16th century which was used to punish women using unwanted language. Iron maiden, a German torture device from the 18th century. A man with four pupils. Connie Culp: The First face transplant in the U.S. In the beginning of May 2009, a woman was all over the news. That woman’s name is Connie Culp and she is the first person to undergo a near-total face transplant in the United States. The procedure took 22 hours and was performed on December 10, 2008. 80 percent of Culp’s face was transplanted. Her entire face was replaced except for her upper eyelids, forehead, lower lip and chin. The 46-year old mother Connie Culp was shot in the face with a shotgun by her husband Thomas G. Culp in September 2004 outside a bar in Ohio. Her husband tried to perform a murder-suicide, but he failed and both of them survived. Connie Culp lost most of the midsection of her face and from 2004 to 2008 she got a dozens of surguries. Before her facetransplant, her disfigurement prevented her to eat and breathe on her own. After the transplant, Connie was blind but she has learned braille and can use her other senses quite normal. The husband was convicted of aggrevated attempted murder and serves a 7-year prison sentence. Connie says she has forgiven him and that she is waiting when he gets out of prison.